Today we're talking all things berries - how to pick the sweetest ones, our favorite recipes, and how to get out stubborn berry stains! Little Man and I are becoming somewhat of strawberry picking experts. I had my heart set on blueberry picking during our Michigan trip, but alas, they won't be ready for picking until several weeks after we leave. The strawberries, however, are ripe and ready! Strawberries in Florida are ready earlier in the spring, so we've already been once. But strawberry picking is the kind of activity that never gets old. There's something about standing out in those fields, surrounded by strawberry plants as far as the eye can see, chirping birds, and a soft breeze with your kiddo. Jacob loves to be out in nature, free to wander around, explore and discover. We went early in the morning when the gorgeous, golden sunlight was just starting to peak through the trees and it gave everything the most magical glow. We picked and tasted, laughed and marveled at nature. It was the best. 1. Check under the leaves: People often grab for the berries you can immediately see, but hiding under plants leaves you'll often find hidden berries. Quite often these are the sweetest because they've been ripening on the vine longer, hidden under the leaves. Strawberries should NOT detach from their stems when you pick them. 2. Look for bright red: Unlike other fruits, strawberries don't continue to ripen after you've picked them off the plant. What you see is what you get, so look for bright red berries. you'll also want to look them over and make sure they are clear of mushy spots or signs of bruising. Steer clear of deep red berries as they are often over-ripe and will get mushy much quicker, if not by the time you get home. 3. Bigger isn't better: I know it's fun to hunt for the biggest, brightest strawberry, but the truth is those big, pretty berries aren't as sweet as their smaller versions. The smaller berries are the most flavorful and are much sweeter and juicier than the bigger berries. You want plump, shiny berries with the seeds spread out and depressed in. Seeds that are very close together and sitting on top of the surface will likely be dry or even bitter. We use a basic streusel muffin recipe with one added change: We dice two cups worth of strawberries and fold them into the batter before dividing it up into the pans and adding the streusel topping. These are SO delicious. The strawberries provide just the right amount of sweet, and the streusel topping adds the perfect crunch. This is so easy to mix up! Mix one cup of water with one cup of sugar in a pan until combined. Bring the mixture to a boil then remove from heat. In a blender mix one and a half cups of strawberries until you have a puree. Add the strawberry puree and two cups of lemon juice (fresh squeezed is best) to the sugar mixture. Mix well and add 8 cups of cold water. That's it! Now, let's talk about what could potentially be the most stressful part of berry picking with kids: the stains. The beautiful red of berries can become a nightmare once they've left their mark onto your child's clothes. Luckily, a friend introduced me to her secret weapon: all® POWERCORE™ Pacs OXI from Walmart. While our muffins baked and our lemonade chilled in the fridge I washed Jacob's jumper. All® POWERCORE™ Pacs OXI fights tough kids stains so it took just one wash following the directions on the packaging exactly and the jumper was as good as new. 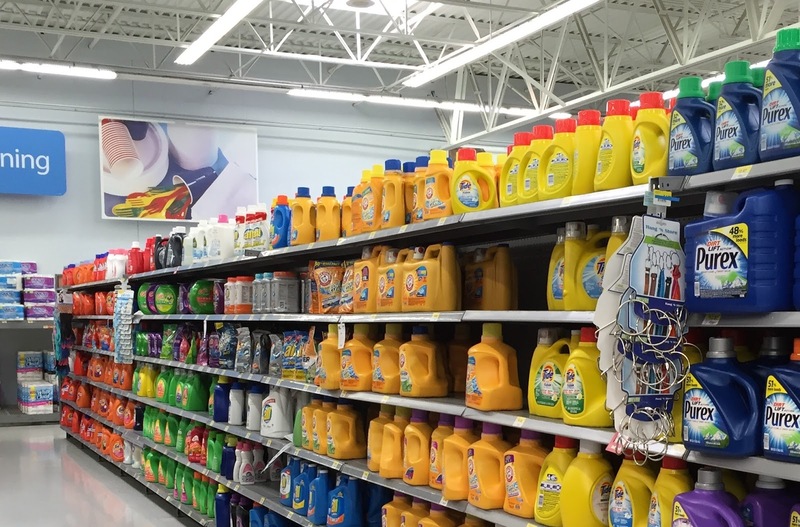 Without momma having to stress about stains Jacob is free to pick and taste to his hearts content. He can explore, have fun and just be a kid! I don't worry or try to keep him from eating as we pick because I know that at the end of the day his clothes will be bright and clean again . What's your favorite berry recipe and how do you get out stubborn stains? Leave me a comment below! 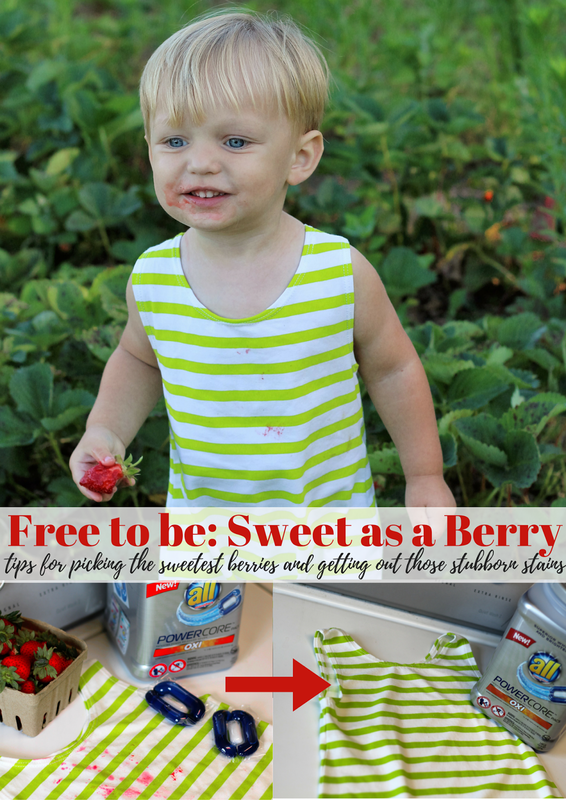 3 comments on "Free to be: Sweet as a Berry"
I took my kids berry picking last week - so fun! But don't forget the sunscreen, those fields get hot!